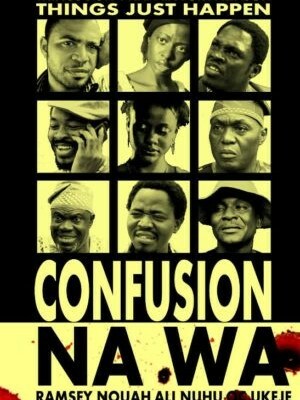 Set in a Nigerian city, Confusion Na Wa is a dark comedy about a group of strangers whose fates become intertwined over the course of 24 hours. At the heart of everything is a phone found by two opportunist wasters Charles and Chichi who, having read through its contents, decide to blackmail the owner Emeka. Little do they realize that their misdemeanors have set in motion a chain of events that will lead to their own downfall. Confusion Na Wa was winner of the 'Best Picture' category at the 2013 African Movie Academy Awards. "Inside Nigeria's Growing Film Industry" By, Tony Cox. NPR. 14 Oct. 2008. Web. "Business: Nollywood dreams; Nigeria's film industry" The Economist Jul 29 2006: 62. ProQuest. "CULTURE-NIGERIA: Writers, Film-makers Defy Censors" By, Koki G. Amina. IPS - Inter Press ServiceSep 12 2008. ProQuest. "Nigeria's film industry reflects the messy process of nation building" By, Armstrong Williams. New York Amsterdam News 102.37 (2011): 113. Ebsco. "Nigeria Nollywood." Africa Research Bulletin: Economic, Financial and Technical Series. 50. 12 (2014): 20215a. "How Demand Sophistication (De-)limits Economic Upgrading: Comparing the Film Industries of South Africa and Nigeria (Nollywood)" By, Helena Barnard and Krista Tuomi. Industry and Innovation 15.6 (2008): 647-68. Econpapers.